This webinar will cover laser engine and beam delivery options for microwelding applications for a range of markets, including medical device manufacturing, automotive components, electronic leads, and batteries. Microwelding can generally be defined as weld penetration <1 mm (0.040 in.) and weld width <1 mm (0.040 in.). Component size typically ranges from microscopic to hand-held. 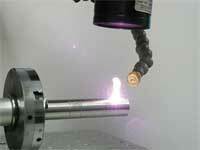 There are a number of microwelding laser sources and techniques available today for the manufacturing engineer. This webinar will discuss the differences between the various laser sources and the manufacturing considerations to keep in mind when you select the best laser for your application from the different commercial options available today. Mark Boyle, Ph.D., is product manager at Amada Miyachi America Inc. In this role, he and his team focus on the development and support of products for a wide range of technologies, including laser welding, resistance welding, microTIG welding, reflow soldering, laser marking, laser cutting, and laser micromachining. Earlier in his career, Boyle worked on a range of laser-based applications using continuous-wave and pulsed fiber, diode-pumped solid-state (DPSS), and ultrafast lasers. He obtained a B.S. in physics from the University of Texas at Austin and holds a doctorate in physics, with the specialty of laser-matter interaction, from the Free University in Berlin, Germany. He is a member of the American Welding Society. As a leader in microwelding processes, Amada Miyachi America provides equipment solutions for tab-to-cell and tab-to-buss bar welding manufacturing in the battery industry. Boyle and his team anticipate emerging trends and potential requests in this area for future process and product development. This webinar is for engineers looking to change from resistance welding or microTIG welding technologies and for any engineers and technical professionals who want to better understand the new laser sources that are available today. For more information on this topic, read Navigating Best Laser Choices Crucial for Microwelding by Brennan Decesar and Mark Boyle, Amada Miyachi America Inc. (Photonics.com, June 2018).